One thing you can rely on every summer is the outraged stories in the press about the sums being spent by Premier League football clubs on the great, the good and the Jozy Altidores. 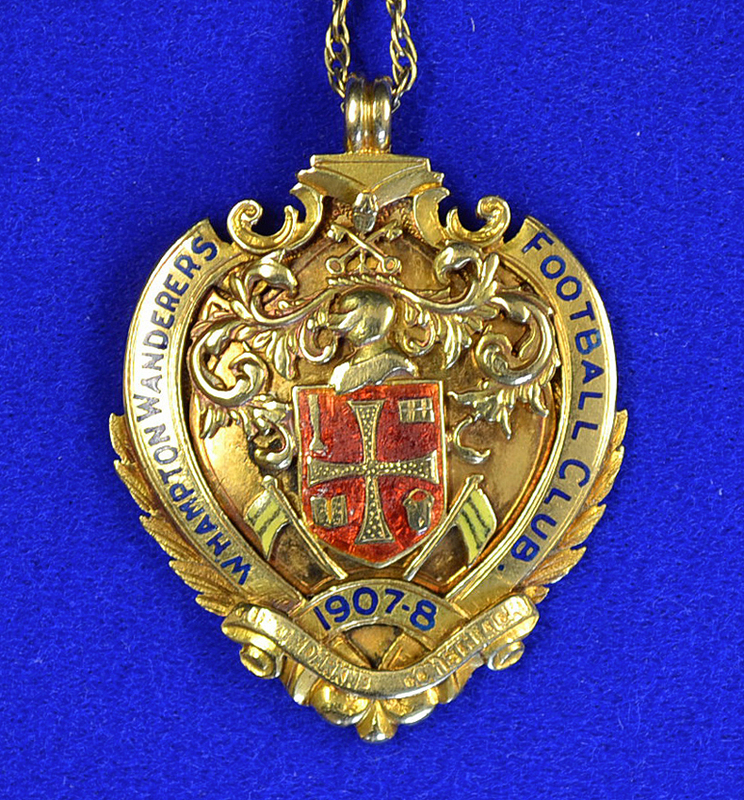 Wolverhampton Wanderers 1908 FA Cup winner's medal awarded to director E Barker, estimated at £4000-4200 in the August 31 Mullock's auction in Shropshire. The eye-watering transfer fees for the top stars such as Romelu Lukaku are even eclipsed of course by the record-shattering Neymar Barcelona to PSG deal, which was brought into perspective by Hansons’ auction lot of original Stanley Matthews contracts. But even at Championship level in England (or second division in old money), the amount spent on transfer fees is rising sharply. This year one of the biggest spenders are Wolverhampton Wanderers, with new faces including a 20-year-old Portuguese international for £15m. Back in 1908 Wolves’ players were probably not so well rewarded, but the directors were surely doing all right for themselves. They even got a medal for a cup win. A gold winner’s medal for that year’s FA Cup Final is coming up in the Mullock’s Rugby & Football sale on August 31 in Church Stretton, Shropshire. The 18ct honour produced by Vaughtons of Birmingham was awarded not a to a player on this occasion but to club director E Barker. To the obverse it has a raised coat of arms with an enamel insert, to the border 1907-8 is marked Wolverhampton Wanderers Football Club and it has a laurel detail to the lower part. To the reverse it is engraved ‘presented to E. Barker (director) to commemorate winning the English Cup’, hallmarked V&S and 18 carats. This medal measuring about 10.5 x 8in (27 x 21cm) comes complete with gold link chain and is presented in a frame. Wolves’ 1908 FA Cup Final success was against the odds, with opponents Newcastle United having appeared in three of the past four finals (although they were yet to win). The Magpies had finished fourth in the first division that season - after being champions in 1906-07 - while Wolves had ended up in an underwhelming ninth position in the second division. Wolves won 3-1 in the final held at Crystal Palace Park. It was their second FA Cup. Early FA Cup memorabilia is highly sought-after by collectors and this medal is estimated at £4000-4200. The very earliest FA Cup items usually do best at auction, especially if connected with Manchester United. In May 2013 auctioneer Graham Budd set an auction record for a football programme. In his sale held at Sotheby’s New Bond Street, the earliest-known surviving FA Cup final programme - Old Etonians v Blackburn Rovers, played at Kennington Oval on March 25, 1882 - shot past the £20,000-25,000 estimate to hit £30,000. The previous record, which Budd set in May the year before, was £20,000 paid for an official one penny match card from the 1909 FA Cup Final between Manchester United and Bristol City. Back then, the price was just higher than the £19,000 bid for a copy of the 1889 FA Cup Final programme (Preston v Wolves) which sold again at Budd’s auction in May 2006.